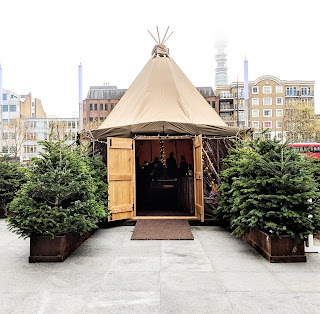 The Winter Retreat is a pop-up tipi tent at Regent's Place Plaza in NW1, just across the Euston Road from Warren Street station. Looking a lot like last year's Thor's Tipi, it will also offer seasonal hot food and drink (catered by the nearby The Refinery), plus board games, live music on Thursdays and Fridays, and more. It's open Mondays to Saturdays from noon til 11pm. "Visit Regent’s Place this Christmas and get cosy inside the festive tipi at The Winter Retreat. Enjoy seasonal food & drink, live entertainment and escape the hustle and bustle of London. With a stockpile of board games, a cosy fire and an endless choice of drinks on the menu, you'll not want to go home. Love live music? Grab your seat at The WInter Retreat Live Lounge every Thursday and Friday with acts including James Frost, Camilli Music and Carmody to get you in the festive spirit."